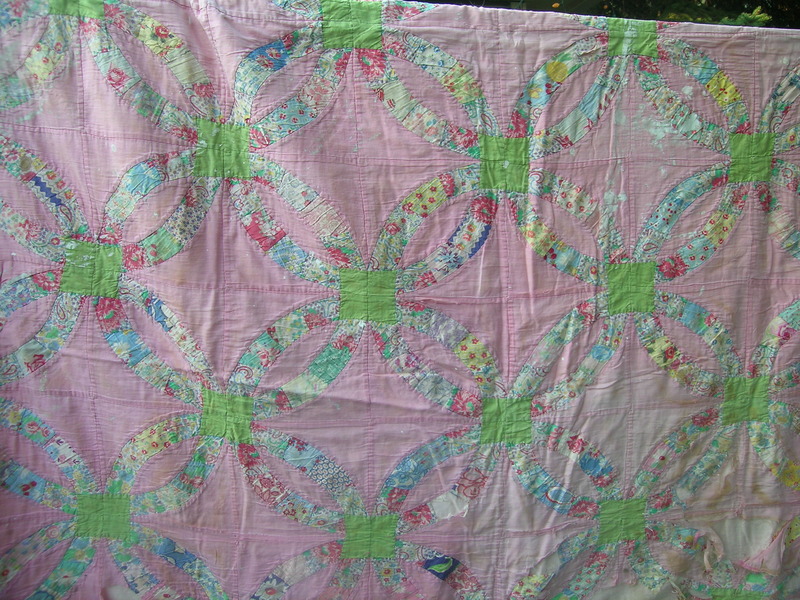 New life for Old quilts? I am on a mission to clear out unwanted items from my house, bring order to the attic, and give away anything that I cannot see me using soon from clothes to yarn to items in the house. The exception is my books, that I actually want to be surrounded with, and the toys and books from the kids childhood that I really want to save. 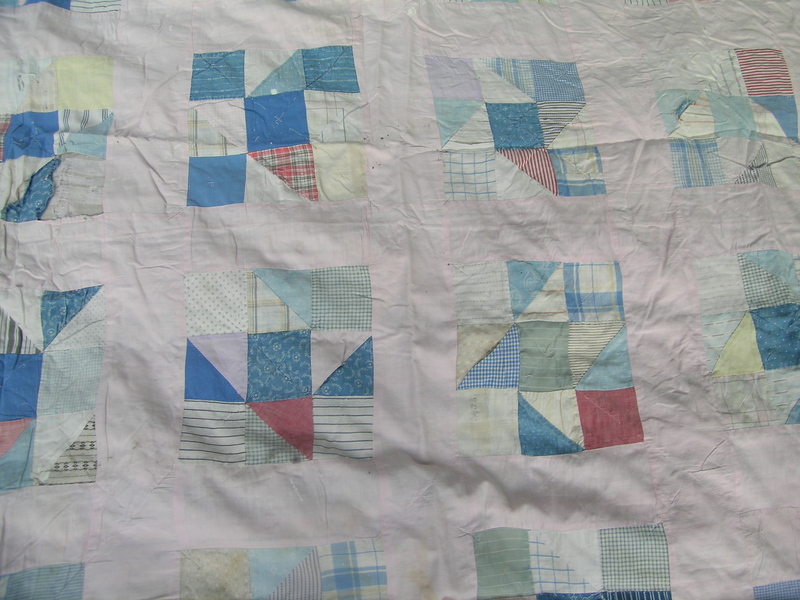 When we first moved into this house, the huge attic was empty save for a treadle sewing machine that had apparently been with the house for years, and 2 old quilts that I discovered. I was so excited to find these, and thought perhaps I could fix them or repurpose them. Unfortunately, the previous owners had used them as drop cloths at some point, and the pink one in particular has white paint spatters all over it. The fabrics are beautiful vintage prints, the pink quilt being a Double Wedding Ring (a pattern that I have always wanted to make myself). 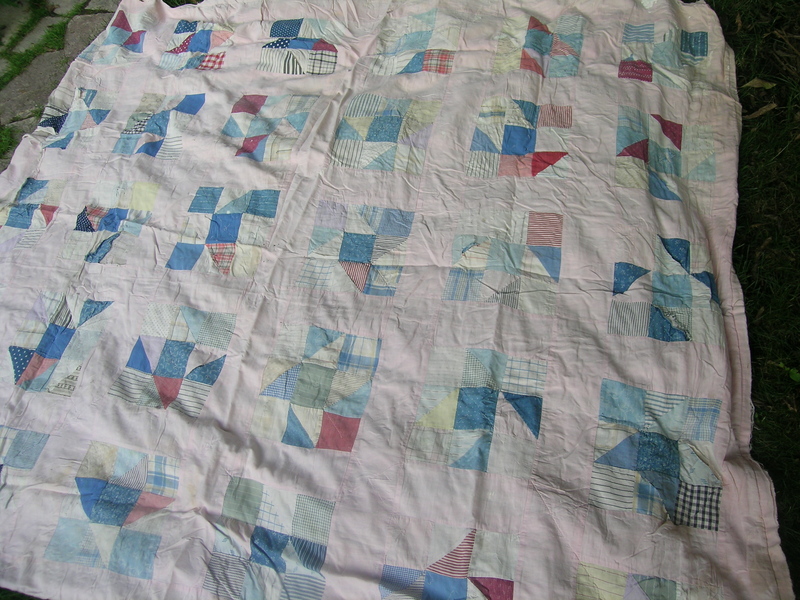 The other quilt is a 9-Patch made with men’s shirting materials. I wonder about the woman who made these, and how they ended up so unloved. Were they made by the woman who raised her 2 girls here as a widow and lived here for 40+ years? Are they older than that, were they given as a gift to someone who lived here. Or, did they come from the people we bought the house from who had them as family items and decided to use them for drop cloths when they were a bit torn and worn. 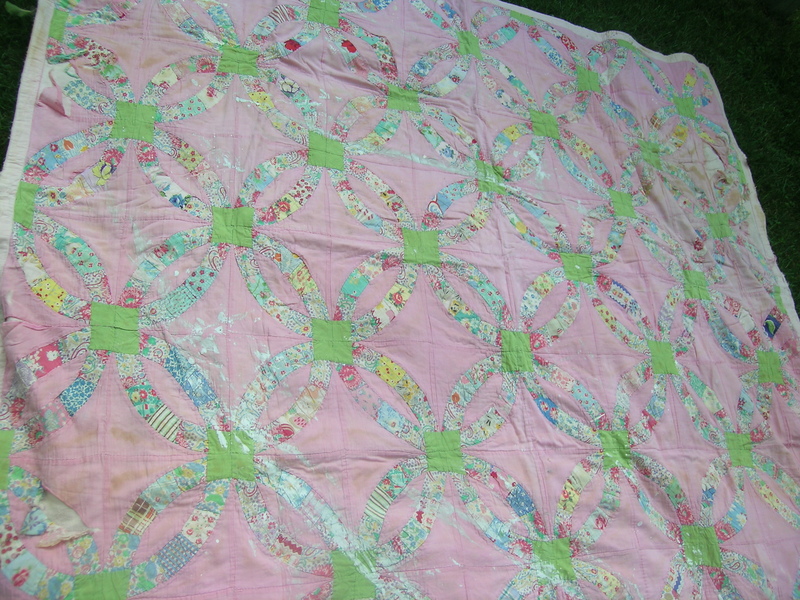 The pink one is hand pieced, and edges sewn on with a sewing machine. The 9-patch is all machine pieced. Were they made with the treadle sewing machine? Quilts seems to have a longer life and purpose than knitting, so I know many of my hand knit gifts will not last. I realized that I will never find a use for these, I had washed them a couple of years ago hoping that they would clean up a bit. So, I posted them on a Ravelry forum and received a few offers to take them. I will pack them up and mail them off to hopefully a rebirth of sorts. Maybe they will become pillows, or worked into toys. I hope that the new owner finds them as beautiful in their rough state as I do. 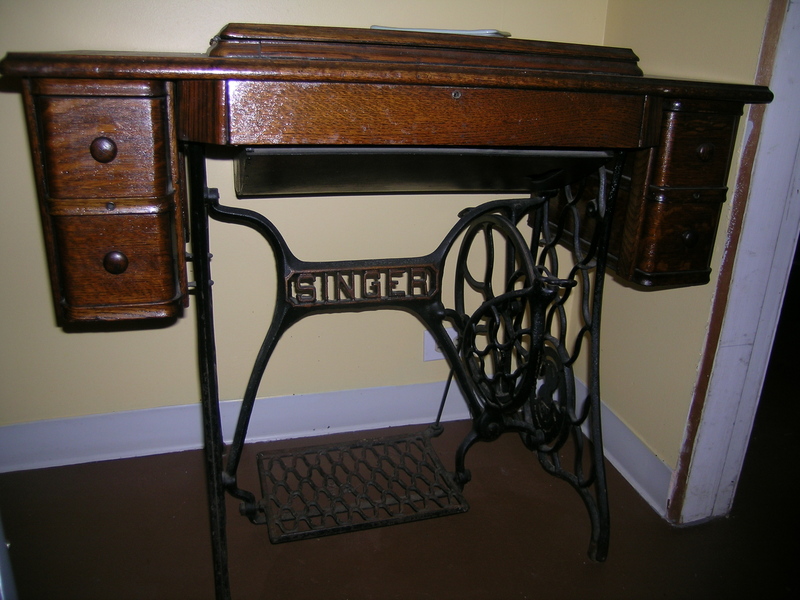 The treadle sewing machine is staying with me though! I haven’t used the sewing machine, although I purchased the belts for it a few years back. It is in my sewing area as a side table. I’m always sad to find hand knit sweaters at our resale store. I always buy them, they are like puppies to me. I got jim one gorgeous fine gauge alpaca sweater there. I hope whoever made it knows it is worn, and loved, nearly everyday in winter. The mom of my friend in high school knit him a orange aran sweater which he wore to work and got concrete spattered all over. He thought it would be easier to tell his mom that he lost it, and he gave it to me. My sister and I wore that sweater inside out for years, trading it back and forth during college breaks. I will never throw it out, although I am sure I will never wear it either.